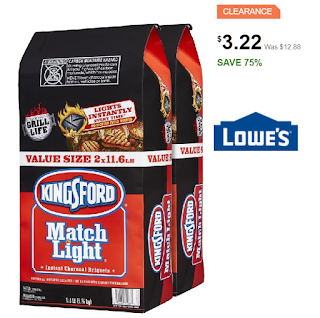 2 Bags of 11.6 Pound Kingsford Match Light Charcoal Briquettes Only $3.22 + Free Pickup at Lowe's. AMAZING CLEARANCE PRICE, GET YOUR ORDERS IN BEFORE YOUR STORE SELLS OUT!! Update: it seems the price varies by store. Not all stores will have the sale price. IF THE STORE YOU CHOOSE SHOWS FULL PRICE then TRY OTHER STORES IN THE AREA and see what the prices are there. Most stores ARE on sale, but not all.